Blinded by the pink! How bright is this dress?! It's funny, I'm not usually one for pink, but I saw this gorgeous vintage number and couldn't resist snapping it up for a few pennies, while shopping last year. I think it's the lovely delicate feather feature that does it for me as they break up the pink and make this 80s number super cute rather than obscenely garish (as 80s fashion tended to be). The dress is has a button detail on the left shoulder and also on the waist, and I really like these touches. The dress is 80s gold, but my only issue is the bust - there isn't much room and I just about managed to squeeze my ample bosom into the top half without cutting off my air supply! 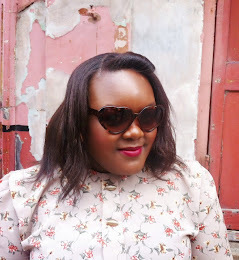 I haven't been vintage shopping in ages and dresses like this are a reminder that there really are some gems out there for plus size girls...you just have to be prepared to search, and that’s what I’ll be doing this weekend. Can’t wait!